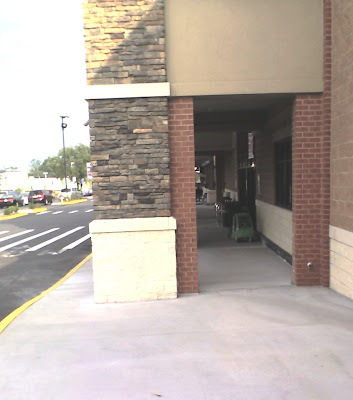 Back in March I reported that the newly renovated Safeway at Seven Corners had designed their shopping cart corral in such a way as to block sidewalk access, forcing pedestrians to walk into traffic. Two weeks ago, the Safeway removed this barrier, and now the sidewalk is completely open, allowing for safe and convenient pedestrian passage as shown in this photo. The manager said that a few months ago they were made aware that their design did not meet ADA requirements, thus prompting the removal of the wall and corral. He did not indicate whether or not any publicity or blog postings were instrumental in making them aware. He expressed pleasure at the new design and said that he supported the change from the beginning. Score one small victory.